I did something special for ME today (and for someone else). I saw this lady in the story with a gaggle of young'uns , a cart full of school supplies and not looking as though she could afford it all. I had just been to the bank machine, so I had some cash in my possession, and shared some with her. I was happy to be able to do that (since I quit smoking, I have saved a LOT in five years! ); it made ME feel wonderful, and she was very, very grateful. I think I made BOTH of our days! A very generous gesture Nancy - I think I will give you some points for that! Oh, WOW - thank you, Jennifer! Did you, perchance, know that I LOVE points (AND cows)? You are a mooooo velous human being! Well yes I do know all of that. I also know that jonescarp.aka.dale.Jan_2007 has about twice the number of point of anyone else - and he will not share with his good friend Nancy - Youngatheart! Yep - he wants me to BUY them - it will be a moon covering the sun when THAT happens------oh, wait! "Points" omeone in the right direction? I need to ask Mark if I can give Nancy 10 points a day until the year 3000. Maybe we could set it up like a bank account. Direct deposit, automatic withdrawals ... .Hmmmm, that might lead to some shady back alley dealings though. Sounds Good To Me. Mark? I could give her 10 points a day for 109.6 years if I start now. Do you think she'll care by then? I heard she likes squash. That's so nice of you! It's always good to brighten someone's day and in turn make yours better. That was a very thoughtful thing to do as I'm sure her school supply lists were ridiculous! Youngatheart.7.4.12 That was a seriously kind thing to do, I am sure you made HER day as well as the kids. School supplies can be so expensive and it is overwhelming for parents at the beginning of the year. Thank you for reminding all of us of how amazing a random act of kindness can be. I always say......the nest way to feel good is to do something for someone else. It always works! Nice Job Nancy. I'm gonna say that you are leading the herd when it comes to random acts of kindness. This is an excellent reminder of another way to brighten your own day by doing something nice for someone else. Seems to me like I had to figure out how to do this the last time, but I got some points today and I think I am going to see if I can't forward them to your account, just for being an inspiration to us all! It's such a great feeling to be able to help someone out like that, it just proves that there are good Samaritans in this world, helping people is what life is all about,you are one sweet lady, friend and fellow Exer. I should've posted a moo pic shucks moovelous! I'll take what's behind Door #3! Funny, I was just going to tell jonescarp.aka.dale.Jan_2007 I figured that's the option you would choose. I appreciate all the effort he has put into finding something to suit your fancy, Nancy! She still wants points, puntos. puntke. Maybe I should take what's behind Door #1????? Oh, Nancy, you are the best! That mother will probably be telling that story about how the nice lady helped pay for the kids' supplies for years to come. Oh, and here's a Belted Gallloway cow for you. Cool looking, huh? They would be worth a lot of extra points in our "Counting Cows" game!! 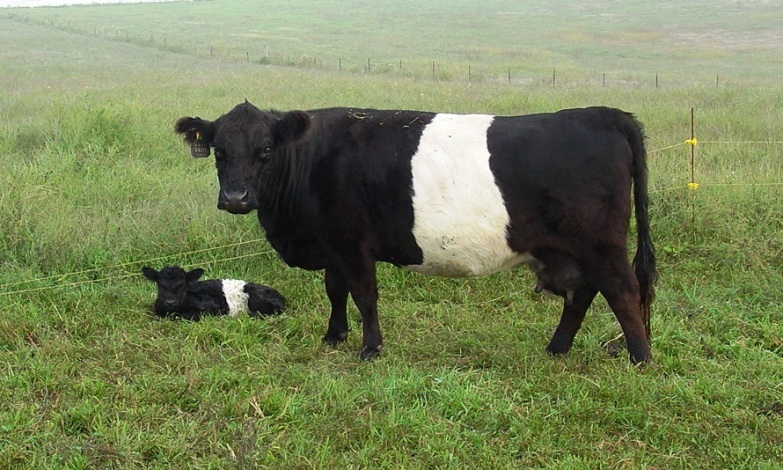 Is he an invisible Belted Galloway? What do you MEAN, invisible? I think everyone ELSE sees him...for that, we will have to DEDUCT points from your account, Youngatheart.7.4.12, hahahahaha. Just TRY to take my points! Youngatheart.7.4.12 I am not trying to take your points! Well, gosh darn it, the picture was there when I dashed from my arrival gate to my departure gate in Newark! I don't know WHERE that darn cow wandered off to... And I had to fly ALL the way back to Newark just to find that cow hiding out in the "Animal Relief"area, acting like everything was all normal. I had wrangle that darn cow all the way to Gate C80 and then onto the plane going to DC just so I could send it to you again. So much effort! That's GOTTA be worth some points! Not sure why but, strangely, her coloring makes me think of an ice cream treat or a layered brownie... Chocolate beef, anyone? Yum. Better than cigarettes, no question! that looks like a chair to me. maybe it was that mechanical bull that put through the ceiling. Giulia They ARE amazing looking cows...love the calf! I am being moderated and SHE who shall not be named, points a gun at me???? There is no justice! Wow Nancy this blog has really gone Crazy !!! Hahaha !!!! First I think what you did for the lady is wonderful I remember so well how expensive is was to buy school supplies for my 4 children !!! I would have loved to have met up with someone like you to help me ! It is a good example for all of us to follow if we can . Secondly I love cows too and that is why I do not eat them anymore !